An Augmented Chord is a 3 note Dissonant chord, built by superimposing two M 3rd intervals. Thus, for example, the C Augmented chord is composed by notes C, E, G . As can be seen, there are no P 5th intervals between these notes, but an A 5th, so this chord is unstable and produces a sensation of tension. The C Augmented chord is represented by “C+”. On the Harmonic Wheel, the Augmented Chords are represented by the spiral red lines. In Fig. 13, we can see how to obtain the notes composing the C+ chord: they are those on the spiral going by note C.
Figure 13. The notes composing the C+ chord (dissonant) are on a Spiral. 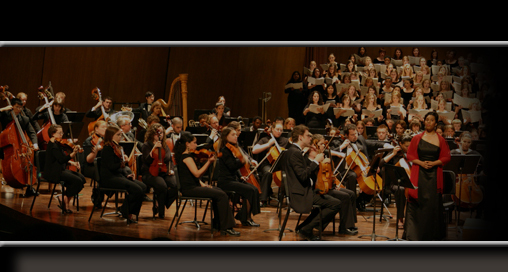 NOTE: In chord construction, the enharmonic notes not following the series of 3rd intervals must be discarded. If we try to add another M 3rd on the G , we shall obtain the note B , which is enharmonic to C (Root of the chord). Therefore, chords C+, E+ and G + are enharmonic to each other, and they are the only three Augmented chords containing the note E. Due to the symmetry present in this chord, there are only 4 different Augmented chords. A diminished Chord is a 4 note Dissonant chord, built by superimposing three m 3rd intervals. Thus, for example, the E diminished chord is composed by notes E, G, B , D . As can be seen, there are no P 5th intervals between these notes, but two d 5ths (tritones), so this chord is unstable and produces a sensation of tension. The E diminished chord is represented by “E ”. 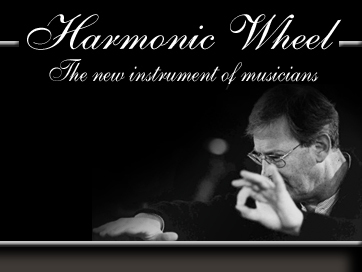 On the Harmonic Wheel, the diminished Chords are represented by the radial red lines. In Fig. 14, we can see how to obtain the notes composing the E chord: they are those on the radius going by note C.
Figure 14. 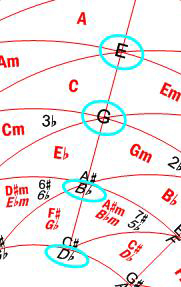 The notes composing the E chord (dissonant) are on a Radius. NOTE: Remember that, in chord construction, the enharmonic notes not following the series of 3rd intervals must be discarded. If we try to add another m 3rd on the D , we shall obtain the note F , which is enharmonic to E (Root of the chord). Therefore, chords E , G , B and D are enharmonic to each other, and they are the only four diminished chords containing the note E. Due to the symmetry present in this chord, there are only 3 different diminished chords. Occasionally, a 3 note chord built by superimposing two m 3rd intervals is also called diminished. This chord does not contain any P 5th as well, but a d 5th (tritone), so it is also dissonant. In our case, and in order to avoid misunderstandings, we will call it “minor, flat fifth Chord”. And, if the root is E, it will be represented by “Em( 5)”. Its notes (E, G, B ) are also on the radius going by note E.
NOTE: The suspended 4th and suspended 7th Chords are not considered here, because they are not built by 3rds, but by 4ths. Nevertheless, their representation on the Harmonic Wheel is very simple too, for their notes are placed on a circumference.